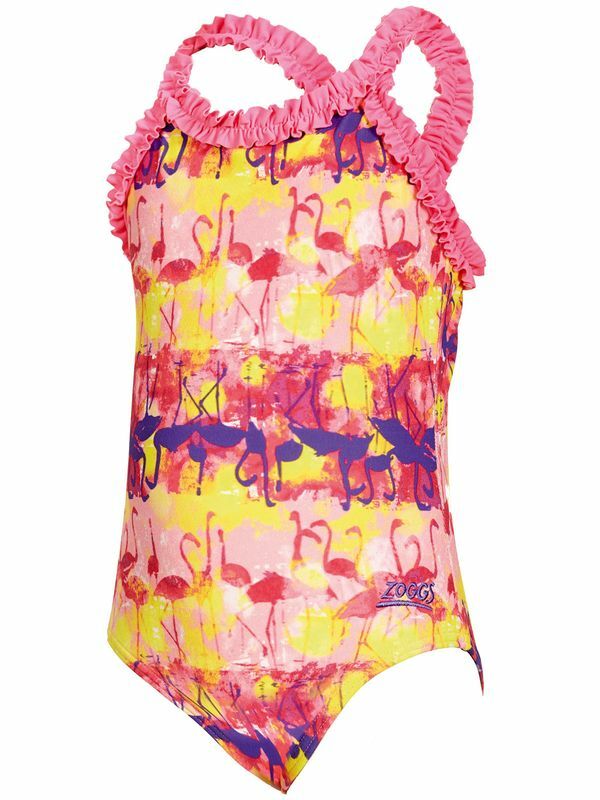 She's going to want to strut around like a pretty and proud bird in the Zoggs Flamingo Ruffle X Back Girls One Piece. With an adorable pink ruffle neckline and strap accents, this flashy one piece features rose, lavender, and ruby flamingos lounging under a golden sun. Of course, even more important than looking cute is being comfortable! Fortunately, the Zoggs Flamingo Ruffle X Back Girls One Piece will fit your little gal like a dream to keep her comfortable and covered throughout her swim lessons. Yep, that means no tugging or messing with straps! Made with quick drying Aqualast fabric, this impressive one piece is made to stay in place through every twist and turn.